There are now more cities being built from scratch, and at a larger scale, than at any other time in human history. There are over a dozen cities either planned or in development, and over half a dozen at a massive scale in areas either mostly or completely undeveloped. The question is what does this mean for the future of our civilization? Before we dig into that question, let’s go over some of the details about these massive undertakings. Many of the biggest projects started in the last 10 years and are scheduled for completion in the next 5 to 10 years. 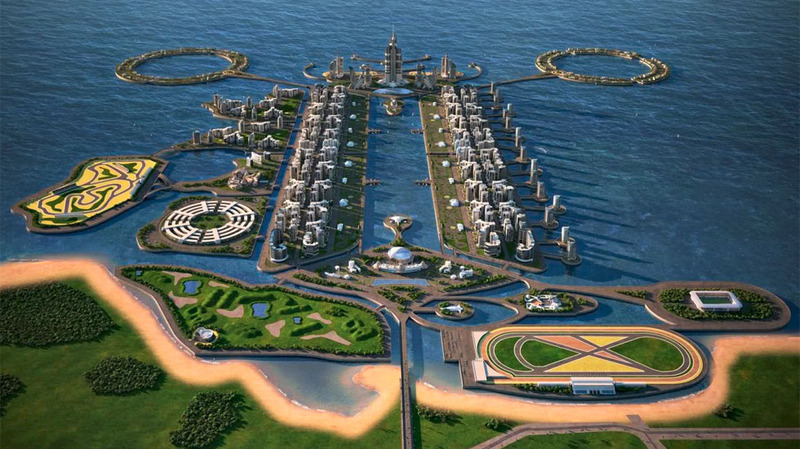 They all carry multi-billion dollar price tags, with most estimated at $20 billion+, up to $100 billion estimated for the Khazar Islands project (pictured above). Most of these projects are aiming for population sizes in the hundreds of thousands or even millions. For example, King Abdullah Economic City (KAEC) in Saudi Arabia is aims to support a population of 1.4 million people. Most of the cities will also be extremely technologically advanced, with cities like Songdo International Business District building trash removal and other services, and Masdar City building in passive climate control not just for buildings but for the spaces between buildings. While these developments are extremely impressive, it’s important to keep in mind that this isn’t a new concept. While Saudi Arabia is building flashy new cities like KAEC and Kingdom City, they also built cities like Yanbu and Jubail as far back as 1975. One of the largest successful planned cities was Navi Mumbai in India, built in 1972, now with a population of 1.1 million people. Going back even further, Brasilia, now the federal capital of Brasil, was a planned city built in 1960. While Brasilia’s design is generally considered a failure due to problems like large stretches of unused land between different parts of the city, it’s grown to a population of 2.8 million. Even the US has seen planned cities, like Columbia, Maryland, founded 1967, which now has a population of nearly 100 thousand. Getting back to the question at hand, how will the increase in number and scale of planned cities impact us? Some of the benefits are obvious, like a huge number of new, modern places to live, and carefully designed layouts as opposed to the haphazard layouts that can come from a city evolving over time. Many of these cities are also serving as test beds for new technologies which could potentially be integrated back into existing cities if they’re successful. While Masdar City in Abu Dhabi is on the smaller side, with a planned population of just 50 thousand, it’s working hard to become a hub for innovative energy technology. There are also obvious problems when building entire cities with a preconceived plan, like potentially filling the city with features before you know how well they work for people or if there are problems with the way they’ve been designed or built. When you build a city from scratch you either have to think of everything before you start and execute on that design perfectly (which is impossible), or be resilient to change. It remains to be seen how resilient these new cities have been designed to be. Some of the more completed cities which have started allowing people to move in are also facing criticism with their population rates, finding it more difficult to attract people and businesses than anticipated. With so many developments underway, and likely many more to come, it’s inevitable that we’ll see significant failures in at least some cities, which means huge monetary and environmental costs were paid where they may not have been needed. The poor design of Brasilia is a great example of this, with far more construction done than may have been required. Despite this shortcoming, the city has still thrived and grown to be larger than even Navi Mumbai, which is generally considered the largest successfully planned city to date, showcasing how even a failed city can evolve to be a success. More than just a test bed for technology and residences for more people, the increasing trend of planned cities also offers other potential opportunities. While the current crop of planned cities appear to focus more on technological and architectural innovations, future planned cities could be perfect for testing new rules and social systems which might otherwise be very difficult to test in existing cities. In his 2009 TED talk, Paul Romer proposes we establish “charter cities” to do just that. As he points out, villages may not be too small to effectively test the benefits of new rules, but testing new rules in existing cities may be too disruptive because people wouldn’t be able to easily choose between living in a city with the new rules or not. Obviously building a planned city with a population of 1.4 million would be far too large (and expensive) for such an experiment, but building a smaller city with a plan for expansion would be a great opportunity to test new systems. One problem with using planned cities as “charter cities” is their significant cost. Financing planned cities is so expensive and risky that it requires a massive payout to lure investors. Testing new rules and social systems only makes the risk higher and could drive away investors, leaving testing some rules and systems to philanthropic organizations. Going the philanthropic route, even if $100 million could be raised, would make it virtually impossible to build a sizable city using the building practices currently employed. This means that in order to test some social systems it may take a complete re-imagining of how planned cities are designed and built. This is what our organization is tasked with if we want to test large-scale social and technological innovations. I didn’t realize that planned cities were even a thing yet! I’m curious whether there have been any planned cities that were started by philanthropic groups, or if they have all been funded by governments and for-profit companies to date. I’m not aware of any large planned cities created by nonprofits, but that’s why it’s important for us to show how it can be done. There have been smaller communities formed in the past, like the town of Arcosani, Arizona, formed in 1970 by architect Paolo Soleri. It’s not exactly a booming city, but it’s a planned community which still exists. Other interesting examples are New Harmony, Indiana (a socialist experiment from 1825-1827) and Dancing Rabbit (an sustainable community founded in 1997). We’ll probably test many technologies and sociological ideas in smaller communities too (when the time comes), but some things can only be tested at the scale of a city. Many ideas break down when you try to scale them up, and some ideas will be strengthened with size.